The VillageReach story began with Blaise Judja-Sato. Born in Cameroon, Blaise was a successful telecommunications executive based in the United States when in 1999, a devastating flood in Mozambique prompted his return to Africa. While in Mozambique coordinating relief efforts with Graça Machel’s community foundation, Blaise was struck by the tremendous challenges of delivering aid especially to the most remote, rural populations. The aid was readily available in Mozambique’s capital city, yet the systems required to deliver that aid to those most in need were grossly inadequate and ineffective. 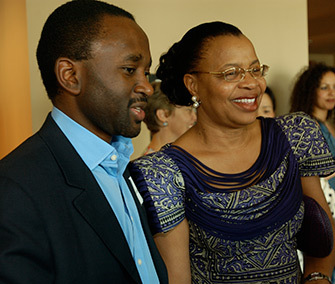 Upon his return to the United States, Blaise formed a small group of advisers, including Michael Free and John Lloyd, to address the delivery problem he experienced firsthand in Mozambique. After extensive research and discussion, the group focused on the fact that while significant public and private sector resources were providing new medicines, vaccines and medical equipment intended to benefit the most under-served communities, almost no attention was given to the significant barriers that prevent the delivery of these life-saving resources, especially where those barriers are most pronounced – – at the lower levels or “last mile” of health systems. VillageReach was formed in 2000 as a nonprofit corporation, and Blaise, together with Craig Nakagawa, Lionel Pierre, and Didier Lavril, launched VillageReach to address the challenge of healthcare delivery. Since its inception, VillageReach has been led by a team of mission-oriented global health, technology, and business professionals. With the support of a dynamic group of donors, partners, board members, advisors, and volunteers, VillageReach has continued to pursue Blaise’s vision of quality healthcare delivered across the last mile to reach those who need it most.